I am no Labour supporter, but do acknowledge that many of the things Northumberland County Council is doing appear sensible. Rationalising assets, co-locating several services in the same building and investing in new facilities to make long-term savings are good management, rather than political ideology. Agreeing with some decisions being taken by the council is not the same as thinking all members are the best representatives of their electorate. Nor should the fact that councillors have won elections be taken as implying they have the support of the majority of people in their ward. Recent letters about Bedlington demonstrate the feeling among some residents who feel they are being ignored and marginalised about important developments in their town. The councillors’ letter (News Post Leader, December 1), while correct in stating that they are the elected representatives, fails to point out how few votes they received. A likely explanation for the poor turn-out is disillusionment with the first-past-the-post voting system. The recent parliamentary by-election in Richmond Park, where the LibDems overturned a 23,000 majority to get Sarah Olney elected, show that the electorate really does have the power to change things. Community leaders and local people who are fed up with their councillors need to have the confidence to challenge them at the elections in May. All the seats on Northumberland County Council and in the parish/town councils are up for election. 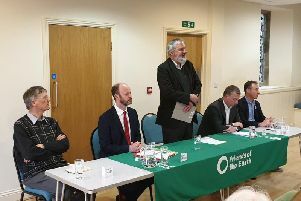 Grass-roots popular support should be more important than a party label, particularly in the case of parish councils, and no previous experience of elected office is required. The role of county councillors is more complex as they need to both be local champions for their division and able to take hard decisions about how to run the whole of Northumberland. Policy decisions should be evidence based and driven by the need to do the least harm to as few people as possible, or to bring the greatest benefit to as many as possible. It is not enough to say no to proposals from other parties simply because they come from others. It is not an easy role and I would urge the electorate to consider if candidates are up to the job, rather than what colour rosette they wear. The leaders of the county council also have to be able to represent Northumberland on the English and UK stage, and have to fight for a fair deal from the Westminster government. Details of the requirements for standing for the county council are on its website. It is possible to stand as an independent. I am a proud member of the LibDems and have stood for the county council several times. I believe there are advantages in being part of a group of like-minded individuals and wishing to see a “stronger economy and a fairer society”. Remember, if you don’t like the current situation the power to change it is coming to a ballot box near you in May. Don’t just grumble, write to the paper or take to social media, become active and either stand for election or support those who do.